The Early Childhood Montessori Teacher Credentialing program for ages 2.5 to 6 is located in Castro Valley, California in cooperation with California State University, East Bay. Our Teacher Education program offers Student-visa (I-20) for foreign students. The Montessori Institute of Advanced Studies believes that each individual pursues his/her own growth within the limits of social responsibility. 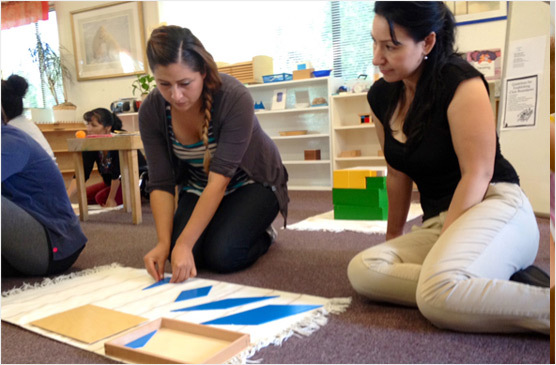 Our training program is MACTE accredited and American Montessori Society-Affiliated. Montessori Institute is very happy to offer the Summer Intensive schedule for those who want to finish the Course in one year. Academic classes will be offered over 5 weeks starting in June 2019. Practicum will begin the following Fall. Summer Intensive students graduate in one year. See the class schedule here. Dr. Angeline Lillard is author of the much acclaimed book, Montessori: The Science behind the Genius. Her latest research, “Montessori Preschool Elevates and Equalizes Child Outcomes: A Longitudinal Study,” was recently published.